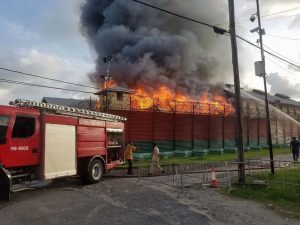 As Sunday night falls, further chaos erupted at the Georgetown Prison and its environs, fire and prison officials have confirmed. 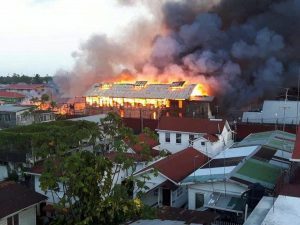 Numerous shots rang out as police and soldiers sought to prevent several of the prisoners who were moved to the officers mess from the burning jail as a holding area. A number of the inmates also burnt the prison officers mess. Meanwhile, numerous inmates were shuttled away in open back truck trays and enclosed vehicles to other prisons and police lockups. Two prison officers were chopped and three shot, reportedly, and were rushed to a nearby hospital. At Buxton, police cordoned off a ditched car that might have been used by a number of escapees. Reports are that shortly after the fire four men hijacked a car on Bent and George Streets and fled the scene. Virtually all of the wooden buildings that made up the Georgetown Prison were burnt to the ground. They include the capital block and part of the administrative building. Prison Chief, Gladwin Samuels said he received a report of an escape and he was on his way to the maximum security jail. 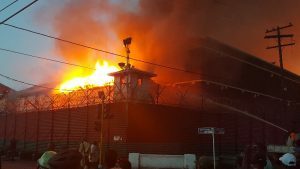 Fire fighters said they were unable to enter the prison compound because the prisoners are armed with guns and the situation is very volatile. Several months ago, 16 prisoners were killed in a fire there.